UPDATE: the plugin has been released. Almost exactly a year ago, we (at ProteusThemes) were a month ahead of our new website redesign. The decision was final – we were about to open our own WordPress theme shop, putting our business at the next level compared to the beginnings on the marketplace. We all knew it will be hard to succeed and we were late to the party, but we were committed to giving it a try and I knew that only by changing the status quo we can survive in the overly saturated market. Selling on the marketplace has two big advantages you don’t even realize before you try to sell on your own: security and reliability of the payment gateway and the tax liability that the marketplace handles for the sellers. Even though I hear everyday people complaining how Envato is unfair and takes a huge portion of the pie I’ve learned the hard way what it means for the EU-based business to follow the laws of the EU for selling digital goods. The VAT MOSS law – which says that the tax of the digital goods has to be charged at a rate defined in the country where the consumer is located – become valid in 2015. For us, that complicated things quite a lot with our launch. ProteusThemes business is registered in Slovenia where the taxation laws are already complicated for domestic billing. Combine this with the VAT MOSS and you get a huge financial overhead where a significant % of the total amount on each issued bill goes for the accounting services. This significant % can make you uncompetitive on a market or – if you go the opposite way and don’t raise your prices to compensate it – make you unprofitable and sooner or later you are forced to close down. I wanted to avoid that huge overhead at all costs but at the same time I wanted to comply with the taxation laws – you know, to 😴 better. Why Existing Solutions Didn’t Work for Us? We’ve made a decision to use EDD in our shop very early on. It’s a great plugin with a huge ecosystem and a community around it, so it’s a safe bet to rely on it. However, we’ve stumbled upon a big problem. Even though the EDD has support for taxes built-in, it doesn’t provide full compliance with the VAT MOSS and other EU regulations. Secondly, the checkout flow where the user has to fill out all the billing information (full address for purchase of a digital product?) was unacceptable by our UX/UI department. “Surely someone had this problem before and a solution for EDD must exist”, was my thinking. I’ve tried to implement two paid integrations for the EDD developed by the 3rd party developers (but the ones that EDD authors recommend in their documentation) and all free ones I’ve been able to found. All of them failed miserably. In the first month since we’ve opened our shop, we’ve been operating with one of the two premium add-on plugins I’ve bought to handle the VAT mess. At the end of the month, I still had to re-issue all the invoices using the software we use internally for the billing and send everything to my accountant. The bill for the accountant services skyrocketed for that month because they had to process each invoice manually. It was a ton of useless and non-productive work which cost me lots of nerves, time, and money. I knew there has to be a better way. So I’ve started digging. I’ve noticed FastSpring for the first time on the websites of some of our competitors. At that time they were all using their hosted cart solution, where you had to redirect your user from your site to the FastSpring-hosted checkout page. It was not ideal but I was desperate enough to make some compromises. I went to the FastSpring website and started learning about their solution. What I found there was fascinating – they were offering exactly what I was looking for. A service where you are relieved of all the burden of taxes, you are not bound with any kind of contract and all you pay is a reasonable fee for every transaction, just like with the standard CC payment gateway providers. A secure, reliable, and beautiful 😍 checkout flow which supports many payment methods: credit cards, PayPal, Amazon Payments are only some of them. Advanced hosted dashboard with reporting where you control everything about your shop. They act as your reseller. Maybe this sounds bad and reminds you of marketplaces, but it has only positive consequences. Most importantly, it’s their job to do all the hard lifting with taxes, invoices, reporting etc. Legally speaking, you are doing business solely with them and they are doing business with your end customers. The good part: contrary to the marketplaces, you still own all your customers. You are in control about the prices, discounts, you get their emails, you can track their way through your site and through the checkout process. Heck, you can even reach out to people who have started the checkout process and already entered their email address but didn’t finish the purchase. It’s a built-in feature. Full support for analytics, checkout tracking, retargeting, A/B testing. Support for selling digital products or services as a single-time purchase or subscriptions. And last but not the least: support for custom integrations via webhooks and a powerful and complete REST API. 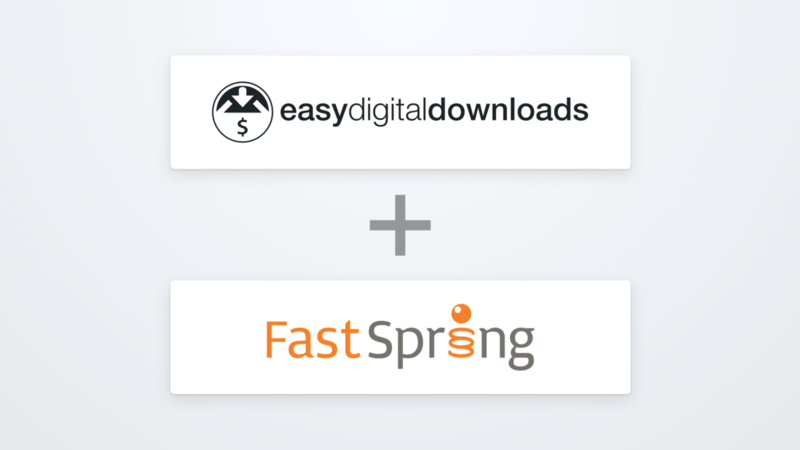 FastSpring is a reseller. A side effect of this is that FastSpring becomes the merchant/vendor/retailer of record for the sale of your product. We collect all applicable taxes from the customers, and we report and pay those tax to the appropriate taxation authorities. In April, I’ve visited PressNomics conference in Phoenix, Arizona. One of the people who also attended and I was excited to meet was Pippin Williamson, founder, and CEO of EDD. When talking to him I’ve mentioned the integration we’ve made between EDD and FastSpring and how great it worked for us so far. He was excited about it and expressed the possibility to include the solution we’ve developed to the official EDD add-ons store. When returning back to the EU, I’ve prepared a draft specification of how the EDD add-on for FastSpring would look like. The next step was getting a feedback from both parties involved. I got an opportunity to present the draft specification for the add-on plugin to Pippin in early July. Except for some minor issues and questions, he liked the proposal and said he’s ready to include it to the official EDD add-on store if we are ready to refactor it from our existing codebase and turn it into a generic solution. Hurray! Due to my own experience with the add-ons developed by 3rd party teams, I knew that I am willing to invest into development of the add-on only if it’s sold as an official integration in their store. I didn’t stop here. I also wanted to let the other party know about it. For a service like FastSpring, I felt there might be a huge opportunity for them to have an official integration with the WordPress. WP is powering nearly one-third of the web, so a solution like this might significantly enhance the onboarding of the new clients for them. I’ve sent an email to our account manager if he can escalate the news to the right people in the management. The feedback I’ve received from them was very positive and encouraging. We’ve met with the FastSpring CTO in a Skype call in August and discussed the details. They went an extra mile so far for providing us with everything we’ve needed for the development and testing. Our main backend engineer, Gregor, has started refactoring our existing solution and development of the plugin in the middle of the August and at the time of writing, we have a working proof of concept. When It’s Ready and How Can I Follow the Development? Planned release date is late October, about a month from the time of writing this. I will let you know once it’s available (check below). We have a living specification for the v1 of the plugin. You can find and follow it here. Secondly, I will inform you weekly via email about our progress. Many people keep asking me how close we’re already with this plugin to the v1 release. Instead of writing to each of you individually, leave me your email and I will send you our weekly progress. We might need beta testers and for sure we’ll ask for feedback in the next few weeks which features we should prioritize for v1. You can shape the functionality of the first version by participating (remember, it’s a living draft I’ve linked to above). I’ll try to arrange to get some discount codes for the people who are on my list when the plugin is released. If you’ll get back to me with feedback, extra karma points, and more chances to get a discount. Get to the list here. Final words: we’re working hard to deliver one of the most stable, reliable, complete, and generic solutions our there for the EDD. FastSpring has worked out for us extremely well so far and there are several reasons why it would work out for you too. In the following weeks, I will share how changing our pricing strategy to subscription-only worked for us. Get on the list and I’ll notify you as soon as the article is out. Next in series: Beta of the EDD Plugin for FastSpring Is Here!